What’s next? Racing obscurity to the finish line and measuring the odds. 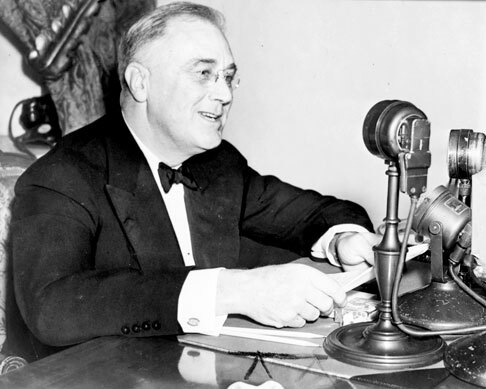 These words spoken on November 11, 1940, by President Franklin D. Roosevelt in a speech commemorating Armistice Day, the annual celebration of the end of first World War were prophetic. Spoken a full year and some weeks before it was even understood that there would be another World War. In a time of peaceful sublimity for America, if not for the world, the words were composed at the height of New Deal successes following the Great Depression. Then, more so than today, the American people still understood the tyranny inherent in the marriage of unbridled wealth and political power, the great house of cards that collapsed in 1929, when the exclusive, privileged world of the financiers, bankers and other wealthy financial predators collapsed under the weight of its own greed, taking most of the country and much of the western world along with it into devastating economic collapse. The New Deal, a huge, multi-faceted government program that served the common welfare of all Americans, an ambitious program that was vilified in its inception as a socialist dream was an unqualified success, finally brought order into the economic chaos, rebuilding the nation, restructuring our priorities. But today and once again, our economy is at the perpetual edge of collapse as another and more powerful breed of financial predators than those who caused the 1929 collapse threatens not only our financial system, but the very air we breathe, the water we drink, as they seek to establish a more crippling autocracy than the common welfare of our nation could ever sustain and must not continue to tolerate. We do so at our own peril. This is the reason and the necessity for the Green New Deal. And like the old New Deal, this Green New Deal has been labeled a socialist dream. but it may well be the last chance for a peaceful political movement to take us back to a proper and sensible path before inevitable environmental and economic collapse necessitates the kind of violence that will always occur when the rich become too rich at the cost of our common welfare as a nation… the most influential nation in the world… such that collapse here at home will have profound echoing effects worldwide. The Green New Deal. If you don’t know what it is… now is the time to find out. Ask me. I’ll tell you how. But don’t wait too long, lulled by the silence and the peaceful sublimities that so often precede the most violent of devastating storms.